The Super Soaker SC 400 is the most compact blaster of the Super Charger (tm) series. As with all SC-class blasters, it comes with its QFD (Quick-Fill Device). Its reservoir can also be unscrewed to refill from a normal tap. Based on the single-reservoir/pressure chamber system, this weapon still packs good power making the SC 400 an excellent back-up. The pump, though moving air, allows for a fairly quick pressurization of the reservoir. The compact nature makes this weapon perfect for running with. It is small enough to hide in one's jacket but does not have a strap of its own. 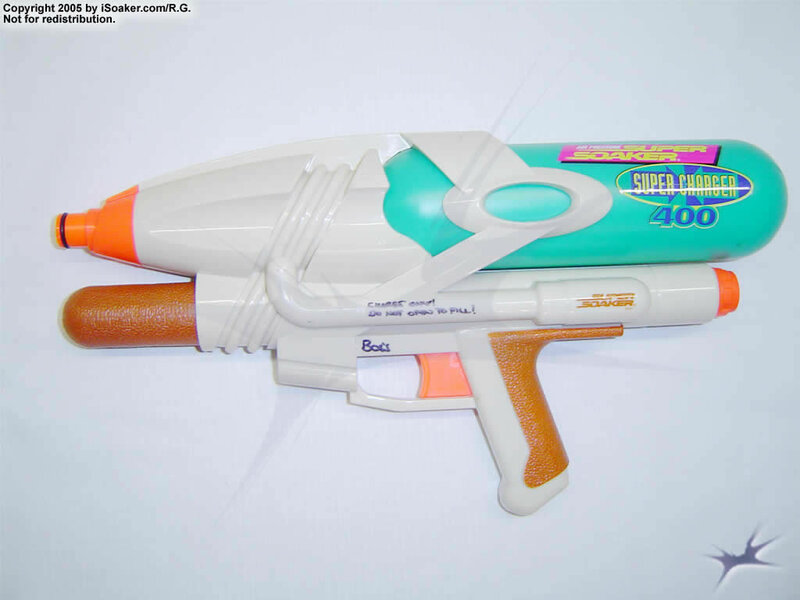 The Super Soaker SC 400 has a good feel to it and would put up a good fight in any small engagement or as a last-resort weapon. Small, light, easy to carry. Despite its size, it packs decent power. It also does not take too much effort to pump up the firing chamber. As with any of the air-pressured water weapons, pumping is required between shots to maintain firing rate. One thing to be careful of is the pumping mechanism which extends from the front of the blaster. This pump, though it appears to be fairly sturdy, should not be left extended for longer periods of time to reduce the chance of falling on it and breaking it, leaving the blaster useless. Nozzle: A typical thin stream about 2x or so, powered by a pressurized reservoir. The power behind it is reasonably decent and gives somewhat decent range, about 2-3ft less than that of my CPS 1000. Handling and trigger: The handle functions nicely and does well, while the trigger works well for tap shots, etc. The grip and trigger have a no-nonsense, straightforward design without anything being too long or short, nor restricting. Pump: The pump can have sealing issues a little bit sometimes, and sometimes just feels weird. It also gets flimsy when left fully extended, and overall the pump motion is a bit unsmooth. However, it has a decent length, allowing more air to be pushed per stroke, and any slight sealing issues can be corrected by some odd method of blocking the air hole (where the reservoir threads into) so air is pushed onto the pump. Overall: A more defensive/backup type blaster, it supplements dual wielding as well as works as a sidearm. Only skilled users who can move, battle, and refill fast should use it as a main blaster unless the battle has more focus on smaller guns and water balloons, or is 1HK/S. (in 1HK/S, the capacity still can run out a bit quickly even if one is tap shooting).